The Return Attribute Set option on the Event Editor allows you to return a selection result as an attribute set, where each layer of the attribute set is dynamically segmented together into one record set. Using the Return Attribute Set option on a network layer will return records separated at any measure along that network where any of the preselected attribute set events change. On a point event layer, the Return Attribute Set option returns the attributes for the entire selected attribute set at each point event. On a line event layer, the Return Attribute Set option returns separate records at any measure along the event where any of the preselected attribute set events change. Additionally, on line event layers that span routes, the return attribute set options returns separate records for individual routes as measure changes for route changes. The process of using Return Attribute Set to return attribute sets for networks, point events, and polyline events is below. In the Edit Events group, click the Attribute Set drop-down arrow and choose the attribute set you want to use. For more information about attribute sets, see Configuring attribute sets. Click the Layer drop-down arrow and choose the network or event layer for which you want to return attribute sets for. Depending on which type of layer you choose, the results of your attribute set will be different. Check the Return attribute set check box to ensure an attribute set will be returned for your selection. Choose a method to select the area of the map for which you want to return an attribute set. If you have a network or event table open in Event Editor when querying an attribute set, your open table will be replaced with an attribute set table of your results. You can only create a new selection when you are selecting an attribute set as result; with the Return attribute set option checked, the selection methods to Add to Current Selection and Remove from Current Selection are disabled. 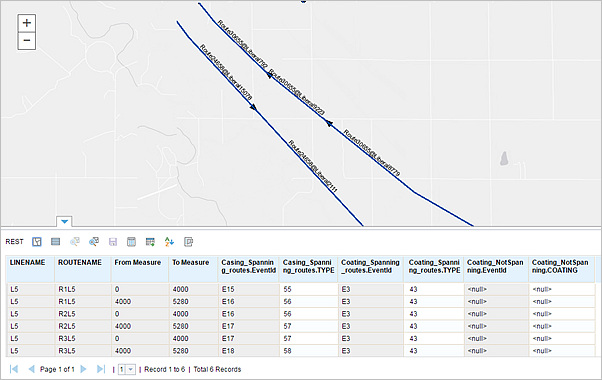 The selected records are shown in the attribute set table and highlighted on your map. To edit attribute sets, see Configuring attribute sets. You can also edit the cells in the attribute set table. The cells in white are editable, and the cells in grey are noneditable. A cell can be noneditable if some other user or the same user in a different version of the database has acquired locks on the event record.